You’d think that surviving the Great War and watching your best friend die in your arms was hell enough for one person. But Frank Nichols has no idea what lies in wait for him at his ancestral plantation in Georgia. 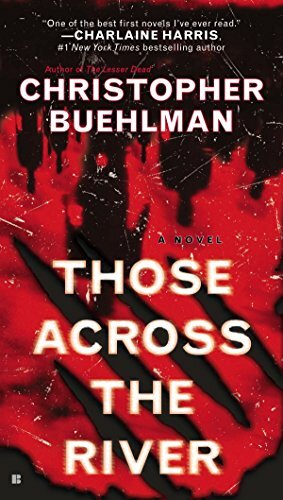 Those Across the River is the debut novel of award-winning poet Christopher Buehlman. This literary horror novel, set in the post-Depression era South, is written in the Southern Gothic tradition complete with hereditary curses, societal transgressions, family secrets and an exploration of social issues of the American South. Frank Nichols and his “wife” Eudora have decided to move into an old family home in Georgia he recently inherited, despite being warned to sell it and move on. The posthumously sent warning letter from his seemingly addlebrained and senile aunt paled in comparison to the scandal and unemployment they were leaving behind in Chicago. The bright yellow house, which they immediately dub “The Canary House,” belies the dark history . . . and secrets . . . that the town of Whitbrow holds. Across the river and through the woods, lies the old Savoyard plantation where Frank’s great-grandfather refused to free his slaves when the Civil War ended. Lucien Savoyard died violently when his slaves rose up against him, and his plantation was vandalized by the Union troops who had come to make him free his slaves. What starts out as a quaint backwoods tradition of dressing pigs up in flowers and setting them free across the river turns out to be the one thing that kept Whitbrow safe. But when the town votes to stop the monthly tradition, terrible things begin to happen. Terrible things that are tied to Frank’s family. When poet Buehlman set out to write Those Across the River, he wanted to create a horror tale “that didn’t insult the reader with flimsy characters, plot holes, or worse, substandard prose.” And he succeeded—for the most part. Frank, Eudora, and many of the people of Whitbrow feel like real people, dealing with the real issues that plagued those who lived in the Deep South after the Depression. The underlying tension between whites and blacks is palpable, while still being palatable. The story flows well, slowly building one layer upon the other, developing the tension of the unknown bit by bit. The reveal of what supernatural creatures are menacing the people of Whitbrow is both sudden and subtle, creating a momentary tension based on doubt. The prose is sublimely crafted and eminently quotable. Sentences dripped off the page like the sweat off the brows of the characters during the hot summer months, entwined around your mind like exotic dancers. It is clear that Mr. Buehlman brings his poetic background to bear in creating the rhythm and meter of the story. That said, the horror is subdued. It is kept at arm’s length and doesn’t even come into the picture until about three-quarters into the story. The “scary” scenes always seem just this side of chilling, never quite making it into “keeping me up at night” territory. Maybe the movie, if one is made, will have better success at creating shivers with the use of tense music to aid it. Is Those Across the River readable? Emphatically yes! It is a well-crafted novel that is a pleasure to read—especially if you have swing on your porch and can sip on a mint julep, too? Absolutely. Was it scary? Not really. But that shouldn’t stop you from reading it.